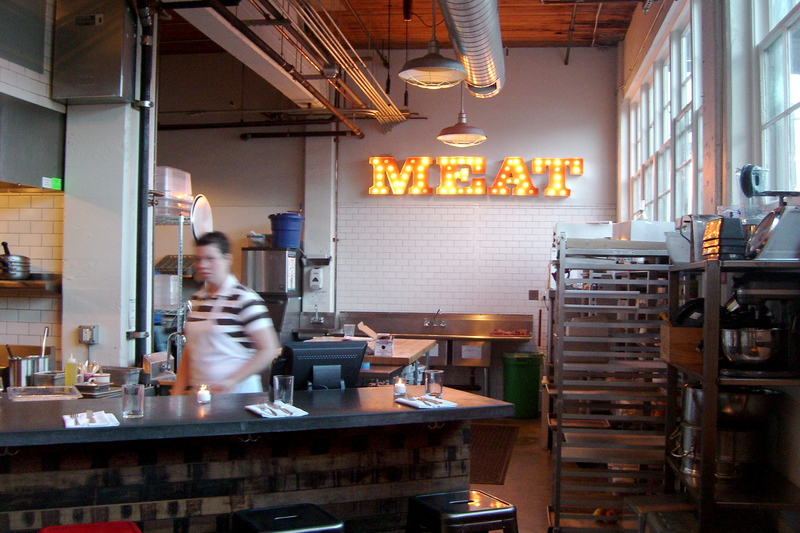 Ummmm… meat. That’s what Jacob and I were thinking as we drove to Olympic Provisions Saturday afternoon. We had been wandering the aisles of Pastaworks on Hawthorne, debating which salami to buy until I remembered that Olympic Provisions has a Happy Hour or “Aperitivo” as they call it. 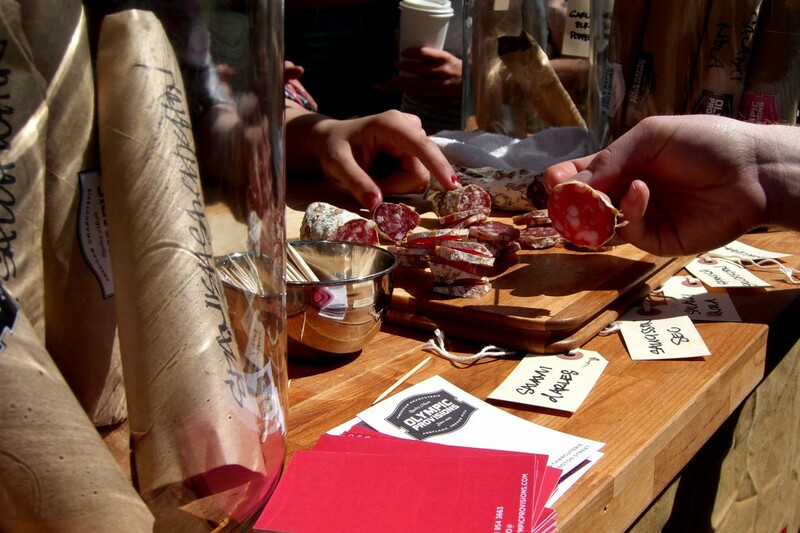 My first experience with Olympic Provisions was at the Hollywood Farmer’s Market, where they had a cute little stand selling salami’s. All summer, I was hooked on their tasty (but kind of expensive @ $8) salami… But their packaging is just gorgeous isn’t it? The restaurant and deli counter, is located right off of Water Avenue in SE Portland. 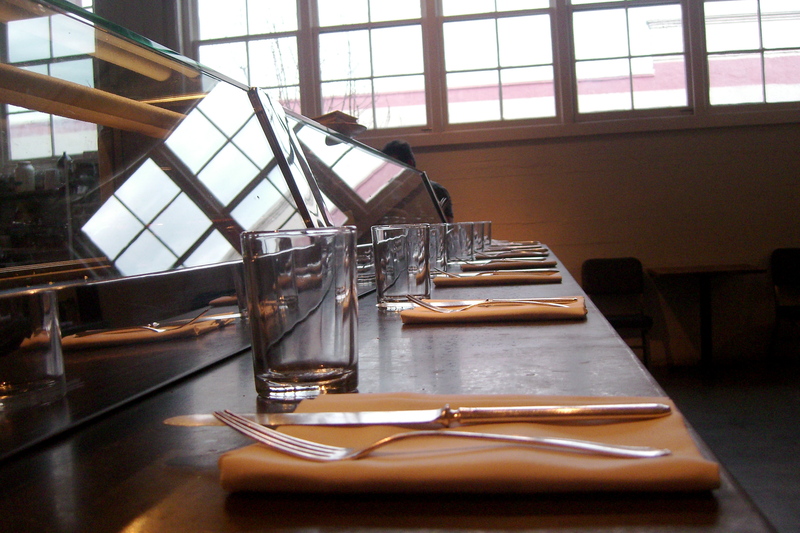 It is a modern, airy space with a number of tables and a nice bar. They have a full dinner and lunch menu featuring sandwiches, egg dishes and a surprising number of veggie dishes of a meat shop. The prices are VERY affordable: sandwiches are around $8, salads $6 and dinner entrees around $12! We ordered the Chef’s Meat plate ($12). 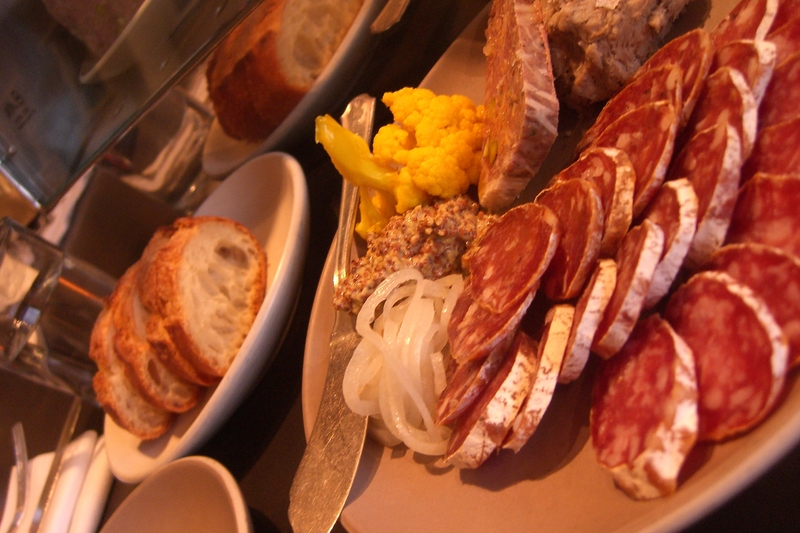 It included 3 types of salami, pork liver mouse, pork terrine, mustard, jelly, pickled vegetables and delicious fresh bread. Most of their cocktails feature Italian Aperitifs, but they also have a large wine selection. But I have to say, the drink I ordered featuring Lillet went beautifully with our food. Sounds like an awesome place! I spy pickled cauliflower among the various meats.